that are great treat for football game half time. Preheat oven to 325 degrees; Lightly spray a 11x7x2 pan with butter spray Sauté onion and garlic until tender. Stir in artichoke and set aside. In a large mixing bowl whisk eggs, parsley, salt, peppers and oregano. Stir in cheese and crushed crackers. Pour into the prepared pan and bake for 25-30 minutes. Stick the center with a clean knife to check if done. Cool 10 minutes and cut into one inch squares. Tip: This can be made ahead and kept in the refrigerator until ready to use. 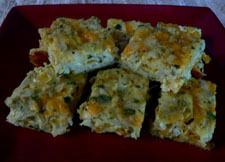 Thank you Denise for sharing this great Artichoke Square Recipe.